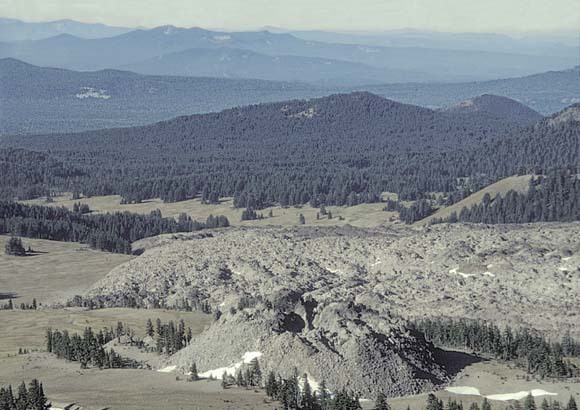 Distributed arc volcanoes in the Cascades of central Oregon. At least 23 separate vents are discernible in this southwestward view from low on the southern slope of South Sister. Vent belt in this continuous reach of the north-south arc is about 40 km wide, east to west. The numerous small volcanoes here consist predominantly of basaltic andesite, but many are basaltic, a few are dacitic, and (in contrast to most of the arc) several dozen are rhyolitic. In foreground, Rock Mesa rhyolite coulee and an adjacent rhyolite dome, both about 2,200 years old, each contain 73.5 percent SiO2. Partly bare cone just beyond the rhyolite flow is early postglacial LeConte Crater, a scoria cone at the source of an extensive apron of mafic lava flows (54.5% SiO2). The Cascade arc includes more than 2,300 Quaternary volcanoes, at least 2,050 of them independent but fewer than 30 of them the andesite-dacite or mafic stratovolcanoes conventionally thought to represent the arc. (Photograph by author taken in July 2001. The Cascade magmatic arc is a belt of Quaternary volcanoes that extends 1,250 km from Lassen Peak in northern California to Meager Mountain in Canada, above the subduction zone where the Juan de Fuca Plate plunges beneath the North American Plate. This Professional Paper presents a synthesis of the entire volcanic arc, addressing all 2,300 known Quaternary volcanoes, not just the 30 or so visually prominent peaks that comprise the volcanic skyline. Study of Cascade volcanoes goes back to the geological explorers of the late 19th century and the seminal investigations of Howel Williams in the 1920s and 1930s. However, major progress and application of modern scientific methods and instrumentation began only in the 1970s with the advent of systematic geological, geophysical, and geochemical studies of the entire arc. Initial stimulus from the USGS Geothermal Research Program was enhanced by the USGS Volcano Hazards Program following the 1980 eruption of Mount St. Helens. Together, these two USGS Programs have provided more than three decades of stable funding, staffing, and analytical support. This Professional Paper summarizes the resultant USGS data sets and integrates them with the parallel contributions of other investigators. The product is based upon an all-encompassing and definitive geological database, including chemical and isotopic analyses to characterize the rocks and geochronology to provide the critical time constraints. Until now, this massive amount of data has not been summarized, and a systematic and uniform interpretation firmly grounded in geological fact has been lacking. Herein lies the primary utility of this Cascade volume. It not only will be the mandatory starting point for new workers, but also will provide essential geological context to broaden the perspectives of current investigators of specific Cascade volcanoes. Wes Hildreth’s insightful understanding of volcanic processes and his uncompromising scientific integrity make him uniquely qualified to present this synthesis. During more than three decades of volcanological studies, he has carried out comprehensive investigations of Mount Adams, Mount Baker, the Three Sisters, and the Simcoe Mountains Volcanic Field. He also brings a broad experience in other volcanic arcs, having conducted integrated field and laboratory investigations at several major volcanic centers in the Andes and the Aleutian arcs. His expertise and perspective have been further enhanced by in-depth petrologic studies of caldera environments, primarily in Long Valley, California, and Yellowstone. On the basis of all these field and laboratory investigations and exhaustive literature searches, he has published three definitive petrologic syntheses addressing the passage and transformation of basaltic magmas from their mantle sources through the crust to form the many types of volcanic manifestations at the Earth’s surface. A major strength of this Professional Paper is that it adheres to data first and foremost, and only then correlates these data with relevant theories. Petrological and geophysical interpretation is left to the later sections of the volume, and even there is never allowed to stray from the pertinent databases. Hildreth&rsqui;s interpretations are not just idle speculations, but are carefully reasoned inferences firmly based on his thorough evaluation of the observational geological data. Professional Paper 1744 should not be skimmed lightly, in the hope that the salient points will quickly rub off. Instead, every section, indeed every paragraph, presents scholarly observations and insightful interpretations that demand careful and thoughtful study. This volume will influence and guide the course of Cascade investigations for decades to come. Download this report as a 136-page PDF file (pp1744.pdf; 46.7 MB).